Four years. Students typically spend just four years in college. After those four years are up, it can be difficult to decide what’s next. Sandoval got a bachelor’s degree in animal science after working part-time in a vet clinic for a couple of summers. Although she is passionate about animals, she finds herself wishing she could go back in time. “[My] advice for people who are younger: really look at [who’s] hiring—not necessarily what you want to do, but look at what jobs are needed,” she suggested. Sandoval, who is recently engaged, now has to consider her fiancé when starting a career. “So [my fiancé] doesn’t want to leave Las Cruces, so I have to find something here. That makes it even harder for me,” Sandoval shared. Sandoval isn’t the only one who’s had trouble starting a career. Her fiancé, Gary Tindal, has too. “Gary has his degree in accounting and finance. He actually got his master’s in accounting. He graduated from his master’s program like three or four years ago. He’s even having a hard time finding work, too,” Sandoval said. Megan has conducted countless job searches over the past few months and hopes to find work soon, even though jobs in Las Cruces are limited and often competitive. Another recent NMSU graduate, Sierra Alfonso, is also on the hunt for a steady job. Alfonso has a bachelor of science in chemical and materials engineering and is still looking for a position that is a good fit for her. “I work at Starbucks right now, so I’m just in customer service. Chemical engineering — one of the reasons why I went into it was because I can make more money than what I would make just working at Starbucks,” Alfonso said. Sierra Alfonso’s sister, Vanessa Alfonso, is a senior at NMSU majoring in early childhood education with a Teaching English to Speakers of Other Languages endorsement. Vanessa is already considering her career plans post-graduation. Vanessa, who has seen her sister spend many hours looking for a job, has realized that finding work after graduation isn’t always easy. “People are always looking for teachers. It might be hard for me to find a job right after I graduate because I have very little experience,” she said. 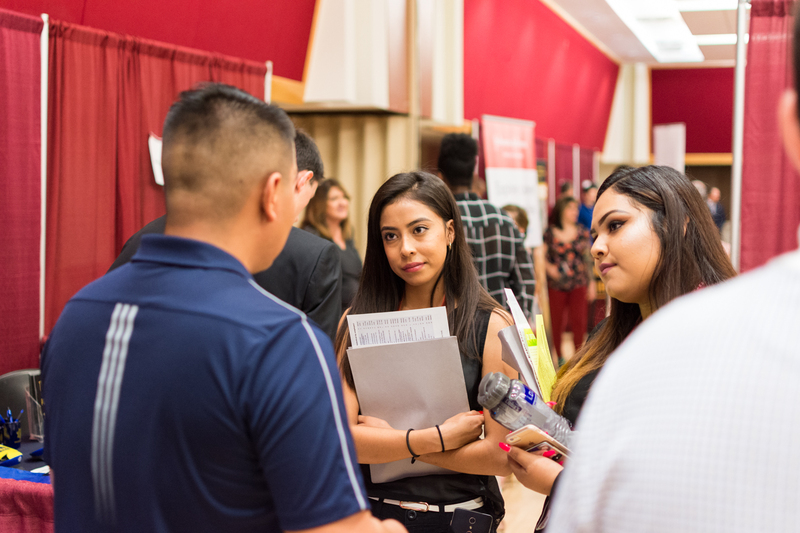 NMSU holds a career expo every year so students can network and explore job opportunities in various states and fields. Megan and Sierra Alfonso were among some of the NMSU graduates who attended this year and turned in resumes. Although many graduates have found themselves struggling to find a job, there are opportunities out there. There are also resources available at NMSU that graduates can take advantage of through Career Services.